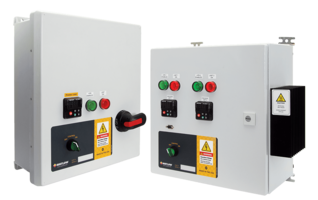 WATCONNECT® SERIES C1 control panels are extra-small, nonhazardous, and simple to setup. A single-phase, standard control panel, the SERIES C1, the WATCONNECT® control panels integrate process temperature controllers with DIN-A-MITE®, offering a full-system solution for a variety of applications. Units offer bottom power entries, full documentation, easy-mount enclosure, and fast-acting fuses. Sensor inputs supported include ASTM thermocouple types J, K and T, 3-wire 100 ohm RTDs and four to 20mA process inputs. St. Louis, MO – Watlow®, an industry leader in the design and manufacture of complete thermal systems, recently introduced the SERIES C1 extra-small, non-hazardous location control panel. This new addition to Watlow’s WATCONNECT® control panel family is simple to order, simple to setup and incorporates Watlow’s thermal components in a UL® recognized package that can be delivered in less than two weeks. The SERIES C1 is a single-phase, standard control panel that is quickly configured for one or two loops. WATCONNECT control panels integrate Watlow’s high-quality process temperature controllers coupled with DIN-A-MITE® power switching devices for superior thermal performance and tight process temperature control offering a full-system solution for a variety of applications. As with all WATCONNECT panels, the SERIES C1 offers bottom power entries for easy access to connections inside the panel, full documentation at the time of quotation to eliminate lengthy approval processes and multiple phone calls, an enclosure that easily mounts to a wall or frame for decreased installation time and fast acting fuses to protect sensitive solid-state components from damaging currents. WATCONNECT panels also support a wide variety of sensor inputs including ASTM thermocouple types J, K and T, 3-wire 100 ohm RTDs and four to 20mA process inputs to ensure compatibility with field equipment. Watlow provides best in class engineering expertise and leading thermal products that enable customers to thrive. Since 1922, Watlow has grown in product capability, market experience and global reach. The company holds more than 980 patents and employs 2,000 employees working in nine manufacturing facilities and three technology centers in the United States, Mexico, Europe and Asia. Watlow also has sales offices in 50 countries around the world. The company continues to grow, providing leading solutions and technology to numerous industries, including semiconductor processing, energy processes, environmental chambers, diesel emissions, medical and foodservice equipment.